Outgoing presiding officer Tricia Marwick oversaw proceedings before successor is appointed. 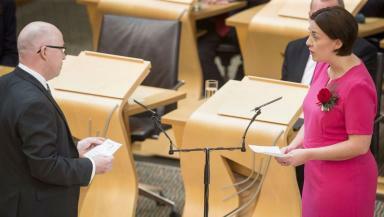 New and returning members of the Scottish Parliament have been sworn in as Holyrood reconvenes. The swearing-in ceremony for Holyrood's 129 MSPs began on Thursday morning and marked the start of the fifth session of the Scottish Parliament. 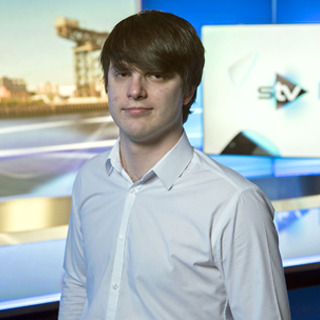 It followed the election last Thursday in which the SNP was returned as the parliament's largest party on 63 seats - two short of an overall majority - while the Conservatives beat Labour into second place. The Conservatives won 31 seats in their best Holyrood showing, while Labour won 24 - their worst. Outgoing presiding officer Tricia Marwick oversaw proceedings in her final day in the post. Later this afternoon the newly sworn-in MSPs will elect a new presiding officer. Members have a choice of two statements to make as they are sworn in: an oath of allegiance or a solemn affirmation. The oath states: "I (Member's Name), do swear that I will be faithful and bear true allegiance to Her Majesty Queen Elizabeth, Her Heirs and Successors, according to Law. So help me God." The solemn affirmation omits any reference to religion: "I (Member's Name), do solemnly, sincerely and truly declare and affirm that I will be faithful and bear true allegiance to Her Majesty Queen Elizabeth, Her Heirs and Successors, according to Law." 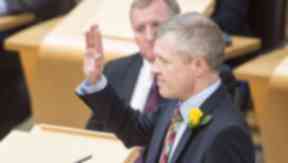 Party leaders were first to be sworn in, with Nicola Sturgeon choosing to make a solemn affirmation. Before making her affirmation, Sturgeon said the SNP "pledges loyalty to the people of Scotland, in line with the Scottish constitutional tradition of the sovereignty of the people". Scottish Conservative leader Ruth Davidson took an oath of allegiance while Labour's Kezia Dugdale made a solemn affirmation. Lib Dem leader Willie Rennie took the oath, while Patrick Harvie of the Greens - whose party have leapfrogged the Liberal Democrats to become the parliament's fourth largest party - opted for an affirmation. Harvie added before his affirmation: "On behalf of the Scottish Green Party and our MSPs, I would like to reaffirm that our priority will always be to serve the people of Scotland and that we support the principle of an elected head of state." The rest of Holyrood's MSPs are being sworn in in alphabetical order, in three 45-minute sessions. SNP MSP for Stirling Bruce Crawford raised a few laughs by taking the affirmation faster than it was recited to him. Lothians list MSP for Labour Neil Findlay emphasised before his affirmation his belief that the Scottish people were "citizens not subjects" and that his allegiance was "first and foremost to them". He accepted his legal obligation to take the solemn affirmation. Scotland's youngest-ever MSP, the 21 year-old Ross Greer, made his affirmation with a clenched fist. All of the SNP's 63 members are wearing white roses as they are sworn in, as they have done since the Scottish Parliament reconvened in 1999 - a reference to a Hugh MacDiarmid poem The Little White Rose. Some 78 MSPs are returning members, with 51 new faces.